Second hand bookstores are awesome. They're dotted all around Sydney, and stock amazing varieties of books, mostly in excellent condition and of course, at awesome prices. 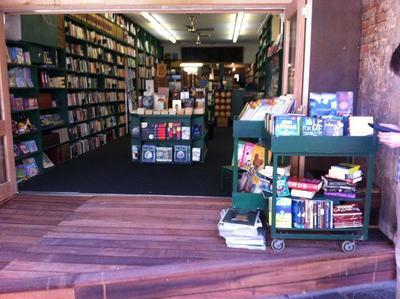 Which is the best second-hand bookshop you've been to in Sydney? My favourite is Elizabeth's as seen in the photo. They have a store in Newtown and Pitt St, they have such a huge variety of books and always at very attractive prices. I recently bought a large, antique book about Cleopatra that was in immaculate condition for $10. I love it! I can't go past Mr Pickwick's Fine Old Books in Katoomba. The place is an absolute labyrinth and you can easily spend hours searching the shelves. Sappho Books in Glebe is also a good one, as is Bridgepoint Books in Mosman. I have visited second hand book stores in the Blue Mountains area which have been incredible, and stores in Newtown which have had a disordered, yet wonderful charm, but my personal favourite is a small store in the Epping arcade called Recycled Reading. The reason this store is my favourite is because it is small, local, easily accessible (it's conveniently close to Epping Station) and the owner of the store is so friendly and polite. It really is tiny though, so if you're hoping for a long, intense browse, I would probably do the trip to Newtown or the mountains instead. Definitely Elizabeth's! I recently spend a whole afternoon there. If you want a bookshop adventure, head to the other end of Newtown and poke into Gould's... it's absolutely massive and has rabbit warrens of books stacked absolutelyu everywhere! You never know what you will find. I know they are not really "bookshops" but I have always gotten great second hand books from St Vinnies and Salvos stores. I always make great finds in shops around Glebe and Rozelle. I've visited some closer to Sydney but can't remember the names. They were in Newtown. If you're after a particular author, your list might be reduced easily. For example, if you're after P.G. Wodehouse, I'd recommend Lamdha Books. If you're after Terry Pratchett, I'd recommend Brown Books. Best place to buy loose tea in Sydney? Best Chinese art gallery in Sydney? Best place to learn Kung Fu in Sydney?